Please check out the SCAR Project at http://thescarproject.org/ for more photos and information. “Breast cancer is not a Pink Ribbon”. Please say that out loud and tell it to your friends…”BREAST CANCER IS NOT A PINK RIBBON”. The diagnosis of breast cancer is a chilling experience not only to the sufferers themselves but also the families and friends around them. The attention breast cancer get is high yet not high enough that we need to not only talk about the pink ribbons but also address what breast cancer treatment is all about. It’s time to take the bull by its horns! Breast is the greatest symbol of femininity in all mammals. In many mammals, the only way to tell the physical difference between a male and a female is the mammary glands AKA breast, or udder in four-legged animals. Breast cancer specifically affects the greatest symbol of femininity tearing down and shattering many women definition of beauty. Cancer treatment, even worse takes away the most prominent feminine features of human beings like hair, eye lashes, breast, skin and nails. I was searching Google on breast cancer survival stories and I noticed that very few stories talk about the emotional pain women go through during their breast cancer fight. Very few breast cancer survival stories address the issue of mastectomy and breast reconstruction surgeries that only happen to well insured and those whose condition allows. 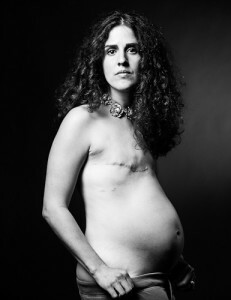 Breasts are normally obscured in non-pornographic photography/media but David defied the norms and used his photography to show how women look after mastectomy. Rather than demoralizing, David’s photography is empowering and creating a new tribe where the world will view breast differently. In many situations total radical mastectomy needs to be done to save breast cancer sufferer life. In some occasions, even reconstruction may not be possible. David Jay’s scar project has proven against the normal expectations that by photographing women for the scar project is not only helping women regain the courage, confidence and positive view of their femininity and sexuality but also empowering the public to view them as beautiful again. To me, these SCAR project pictures show a new shift in society’s acceptance of a tribe of scarred, breastless and one breasted women. It is a high time we start accepting SCARRED women are just as beautiful since 1 in 8 women will be diagnosed with breast cancer at some point in their lives. This new tribe inspired by David is growing and will at some point in future became the norm, just the same way we no longer see pregnant women as unattractive. This exposure will help women to accept what we might not be able to change. Perhaps fashion designers will soon start making bras for women with one breast and accept them as “normal.” What if not having breasts or having one breast became acceptable? What if mastectomies and scarred breast are seen as a symbol of honor and strength? What if the society could tone down the breast obsession with breasts just a little bit and appreciate David work on SCAR project for pioneering the new “normal” for breast cancer fighters and survivors? Share this article on Facebook to appreciate David Jay’s Work.